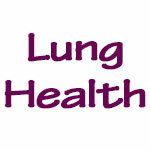 By a News Reporter-Staff News Editor at Cancer Weekly -- LUNG cancer is one of the world's biggest killers. In the UK it accounts for six per cent of all deaths, largely because treatment is often ineffective by the time symptoms are diagnosed. But researchers at the University of Huddersfield are working on a breathalyser device that will be able to detect very early signs of the disease, making a cure much more likely. And it will be pharmacists who administer a test that has the potential to save hundreds of thousands of lives (see also Lung Cancer). "The intention is that we will catch patients before they start getting the symptoms. Once lung cancer patients start experiencing symptoms it is often very advanced and has a very low cure rate," says Dr Rachel Airley, the University of Huddersfield lecturer who developed the breath test project. It has received backing of £105,000 from Dr Philip Brown of the S.G. Court Group, a pharmacy chain based in the South East of England, where initial trials will be carried out. The University itself has provided matching funding. "We are looking to be able to distinguish between patients with early lung cancer and patients who have maybe got bronchitis, emphysema or non-malignant smoking related disease...or who have maybe just got a cough."